Sunday morning I head up to Price to pick up Larry Newby of Redtail Aviation. Larry estimated it was a half hour flight. Once in the air I find a headwind and I begin to doubt that I have enough gas so I divert to Green River to fill up. 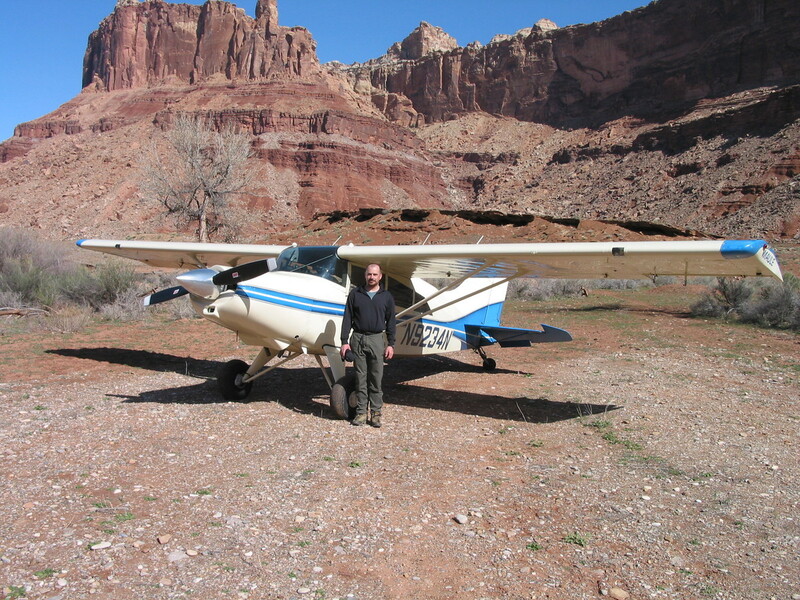 Larry's a big fellow with a huge enjoyment of flying the Utah back country. He tests me out with some steep turns in a canyon to look at an old ranch. I ask him where we are allowed to land and he tells me its pretty open down here. There are a lot of old landing strips but most times straight sections of county roads end up being the best landing sites. We first stop at Mexican Mountain, approaching from the south east. We are flying down below the canyon rim but the canyon is wide and I feel comfortable doing this. My biggest challenge is touching down exactly where I intend. These runways are narrow, with little room for lateral error. I'm a little off to the left on this landing but mostly stopped by 2/3s of the way to the end. We also land at Hidden Splendor, which has an interesting approach. Two vertical cliff walls come together in a V shape, pointing south. 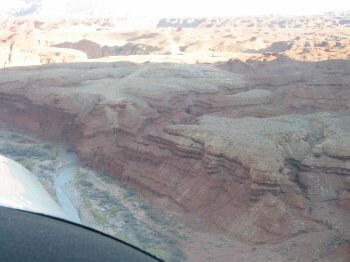 Muddy creek flows out the southern point of the V, forming a deep, narrow, and twisting canyon. The Hidden Splendor landing strip is in that V. To the north there is open, gently rising terrain. To the south the cliff walls converge into the Muddy Creek's canyon. You can approach from either direction. Approaching from the north is easy but the go around is difficult: you have to turn around in the tight apex of the V. The south approach is done in the canyon. This is more challenging but the go around is easier. The runway slopes up to the north. To add interest it has cliffs on both ends and large drop offs to either side. It is, at least, long. Larry, of course, prefers the canyon approach. The wind is from the north so the south approach is preferred. Larry talks me through the approach. In the down wind leg you fly over one cliff of the V and follow descending terrain. Base turn is made into a side canyon. I later realize that this is "The Squeeze", AKA Seger's Hole, a canyon I descend at the end of this trip. 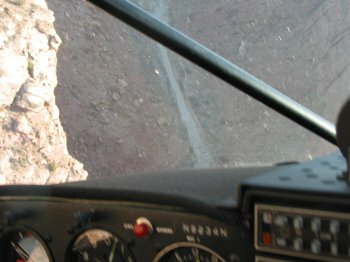 Larry says that in calm conditions he usually flies the base leg below the rim of this little canyon. We have a lot of turbulence and I'm not comfortable flying that low. 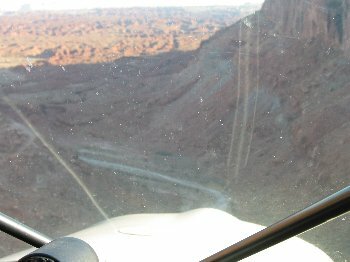 Turning to final we pass over a low point in the rim and drop into the larger canyon of Muddy Creek. The north wind is getting pinched into this canyon and flowing up out of it. I apply full flaps and point the nose down but the plane is slow to descend. We fly first near the right wall, back to center, then near the left to line up on the runway. I'm well on center and roll to a stop at the mid point. 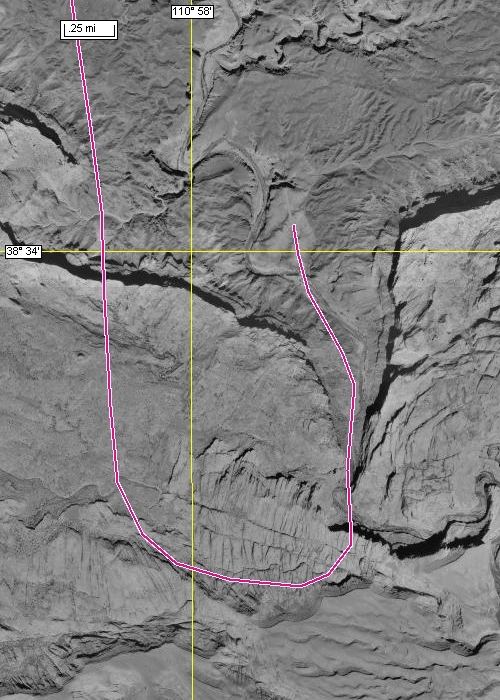 Below is my GPS track of this approach laid over aerial photos. Below that is a sequence of pictures shot by Jeff on latter approach. 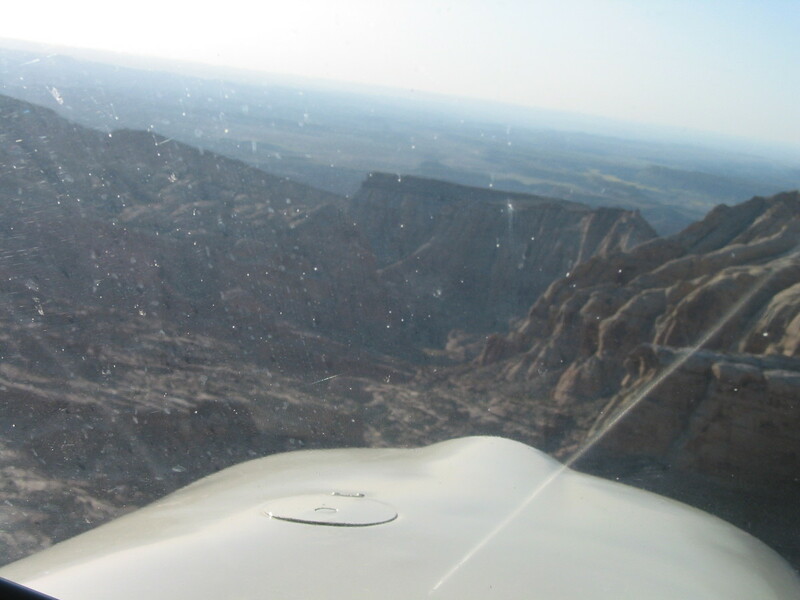 On later approaches I mistakenly flew my base leg over the canyon north of Seger's Hole. This generally worked out fine, but left me a shorter distance for descent to the runway. Me and 9234N at Mexican Mountain. Larry and me at Price, after the lesson. Approach to Hidden Splendor, on down wind leg after crossing cliff. Dropping over the rim into Muddy Creek. Turn to the left side to align. Turning back toward the landing strip. I would never have done that approach with out Larry in the airplane to talk me through it but nothing on the approached seemed difficult. I feel that I've received enough good training that I'm prepared for most situations but worry that someday something unknown will rise up and bite me. I ask Larry this question. He echo's what Lavar earlier said: as long as you keep flying speed and don't get trapped by rising terrain you should be fine. Larry's main advise about rising terrain is to always have a plan. 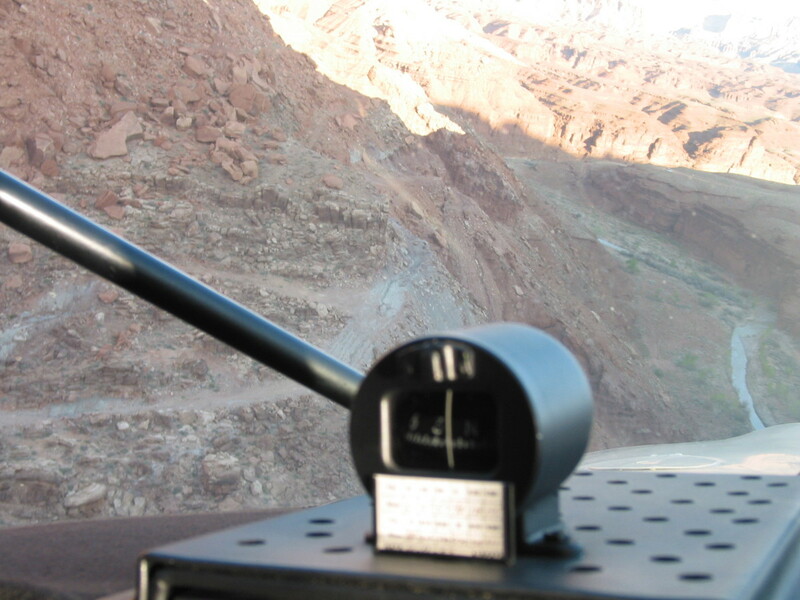 Know where to turn to find the slowest rising terrain. Find rising air over dark rocks. Follow birds, they'll know where the rising air is. Larry also said that I can fly right next to cliff faces, the wind will never push me into the rock. For the rest of the lesson we fly over roads scoping out landing sites near where the kids may camp. We see Marshal and Megan driving the roads by Cedar Point, also checking out camping. There are not many options near Cedar Point but a good road section by Burr Point. In the end, I decide to not land on any roads during this trip. I think any accident off a road would not be covered by my insurance and I'm not feeling competent enough to take that risk. On the way home Larry tells me a story about being over this same piece of deserts in someone else's M7 with the fuel gauges reading about same as mine are now reading. They stopped at Green River and, after fueling, figured they would not have had enough fuel to make Price. Larry has a nice way of suggesting what I do with out directly telling me. Arriving at Green River there is a strong cross wind at 90deg to the runway. This is the strongest cross wind I've yet landed in. After touch down the wind gets under the upwind wing and starts to roll my plane off the runway. I hit the power and fly off the runway. (Larry responds quickly and for a while we are both flying the airplane). I ask him what I should do differently. He suggests lining up on the upwind side of the runway AND using rolling in the aileron cross wind correction sooner. Next landing is nice as straight. Through this trip cross winds are a constant challenge. I get a lot of good practice and occasionally choose a cross wind landing over a better aligned runway just for the experience. No other landings go nearly as bad as this at Green River did, but gusty cross winds make the landings inconsistent and often rough enough that I never feel fully confident. 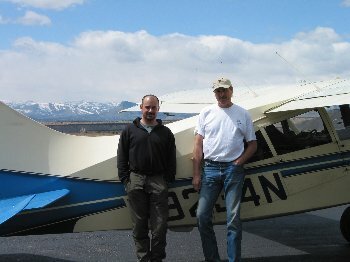 I figure that flying a tail wheel airplane has set back my ability to land in tricky situations. More so than the tail wheel gear allows me to land on rough strips. In fact, none of the strips I use on this trip would be any problem for a tricycle gear plane. Larry himself flies a tricycle Cessna 152 (with 150hp engine and beefed up front fork). Any landing site rough enough to require tail wheel gear is too tricky for my current skill level. 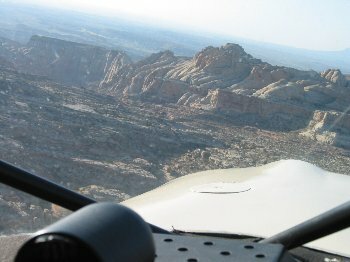 Returning from Price I fly along the eastern edge of the San Rafael Swell, identify canyons I've hiked, spot new canyons I want to hike, and appreciate the how the uplift warped the rock layers. Back at Hanksville I find that Tyler Jetty has arrived but the Post kids are delayed by car troubles.